On August 28, the New York Times published an article called: “Heavy Use of Banned Cluster Bombs Reported in Syria”, which – one would imagine – was about Syria’s use of cluster bombs. A careful reader could come away with some information about Syria’s use of bombs; but any reader would be led to conclude that Israel is the worst offender on the planet. Cluster bombs, outlawed munitions that kill and maim indiscriminately, have caused more casualties in the Syrian civil war than in the 2006 Lebanon conflict, when Israel’s heavy use of the weapons hastened the treaty banning them two years later, a monitoring group said Wednesday. Jan Egeland, a Norwegian statesman and diplomat who at the time of the Lebanon conflict was the top humanitarian aid official at the United Nations, described Israel’s use of the weapons as “completely immoral.” Mr. Egeland’s criticism was widely credited with helping to galvanize the efforts to achieve a treaty two years later known as the Convention on Cluster Munitions. To cap off the review of Israel, a fourth phrase “completely immoral” was given to “the top humanitarian aid official at the UN”. That totaled four attacks on Israel in an article about Syria’s use of cluster bombs. And how many negative comments were there against Syria – which was the subject of the story, and had more injuries than Israel? ZERO. Further, the article was written in a manner that made it nearly impossible for a reader to clearly see that Israel used the weapons LEGALLY BEFORE THERE WAS ANY TREATY IN EXISTENCE. It inverted this point by repeatedly saying that Israel’s actions caused the treaty to come into existence. The singular focus on Israel and phraseology were just the beginning of the Times’ crime creation. Crime inflation was to come. Gross omissions from the report gave the incorrect impression that Israel was the only country that used such weapons. In fact, according to the Cluster Munitions Monitor, 22 governments used the weapons in 38 countries since World War II. Today, over 90 countries hold stockpiles of the munitions. None of those points made it into the Times’ article. On top of the obsession, wording and lies of omission, were complete falsehoods. The “hundreds of thousands” of bombs figure attributed to Israel was over-stated by about 250 times. It took three days for the Times to post a correction noting that the correct figure “was about 1,800 bombs”. Megan Burke, another editor of the “Cluster Munition Monitor” report, said the widely accepted data for the Israel-Lebanon conflict showed 249 cluster munition casualties between July 12, 2006, and April 12, 2007. The time period goes beyond the conflict’s end to reflect the effects of the unexploded Israeli bomblets. The United Nations has said that many of the Israeli cluster bomblets in Lebanon did not explode, essentially turning them into booby traps that required an extensive cleanup operation. A nice usage of “Israeli bomblets” twice in a single paragraph. By this point, “bomblet” is almost synonymous with Israel in the article as no other country in the article is married to the munitions in this way. More egregious, the casualty figure is only compared to the 264 deaths in Syria until the very end of the article. If one were to read and report on the study, one would learn that the number of casualties from “Israeli bomblets” totaled 0.5% of the total casualties inflicted by cluster bombs – or roughly 1 in 200. The article finally mentions some other countries at the end of the article – in a passive way. It notes that the number of casualties in Laos, Vietnam and Iraq was higher than in Syria today, but it does not state who the perpetrators dropping the bombs were. Maybe bombs just happen when other countries are involved; only Israel actively drops “Israeli bomblets”. If the Times had cared to educate a reader, or if it cared to comment on a country other than Israel, it might have noted that the only country which continues to produce, export and use cluster munitions is the United States. But the goal of the Times is clearly not to educate or report facts that disrupt its Israel-bashing narrative. It is a sad but reliable continuation of Israeli coverage by the New York Times: it creates and inflates crimes attributed to Israel. Now, it is even featured in articles about other countries, in case you missed their point elsewhere in their “news” coverage. It is not easy to be a journalist in the Middle East. The Middle East / North Africa (MENA) region is the only part of the world which does not have a single country with a full free press. This compares to Western Europe which does not have a single country without a free press according to Freedom House. The profession has become much more dangerous as seen by the murders of two American journalists in Iraq by ISIS in August and September 2014. Some 70 journalists were killed around the world in 2013, the majority in volatile Muslim countries including: Syria; Iraq; Egypt; Pakistan; and Somalia. Journalists lucky to be alive are often intimidated in their coverage (Gaza) or jailed (Turkey, Egypt and China). Free press is only part of the problem in the region. There is virtually no freedom of assembly or freedom of speech. Protests in many cities around the world have been halted by government crackdowns – including in the United Kingdom and the United States. Curiously, academia, which prides itself in freedom of expression, has singled out Israel for BDS (Boycott, Divestment & Sanction). Israel ranks far ahead of any country in the MENA region in every category of freedom of press, speech and assembly (Israel ranked #64 globally compared to the Palestinian Authority #182). Many pro-Israel people (myself included) have complained over the past several months that mainstream media’s coverage of Hamas neglected to refer to the group as “terrorists”, as the group is so labeled by: the United States; Canada; European Union; Japan; Israel; and Egypt. I believe that we have missed a more basic flaw in describing Hamas, namely that it is the majority democratically-elected party of the Palestinians. Hamas is the popular, mainstream political party that the Palestinians chose by an enormous margin (58% in a multi-party parliamentary system is a landslide; second place Fatah won 33% of the seats). When the Palestinians placed their votes, they all understood that Hamas was rabidly anti-Semitic, sought the murder of Jews and complete destruction of Israel, as it described clearly in its 1988 Charter and in repeated statements by its leadership. Further, Palestinians voted for this party knowing not just of Hamas’s positions, but of the world’s policy of isolating Hamas. The media has not only ignored this, but has deliberately concealed this fact. Look at the adjectives used for Hamas: it is described as “Islamist” not “Palestinian”; it is described as a “faction”, not a “political party”; the group is described as having “seized” Gaza and does not convey that the people freely voted for the terrorist group. Through the media’s – and world bodies’ – obfuscation of the Palestinian people’s complicity in the current situation, it dangerously absolves the Palestinians of responsibility. Palestinians have been artistically separated from their democratically-elected leaders who are carrying out the exact campaign promises that the Palestinian voters enthusiastically endorsed. A reader of the photoshop-ed news is therefore led to conclude that Hamas is similar to ISIS in Iraq or Boko Haram in Nigeria or other declared terrorist groups. However, those groups are indeed “factions” and “Islamist organizations” that are apart from their respective governments. They were not elected by the people. In the West Bank and Gaza Hamas is the government and represents the Palestinians’ desires, irrespective of world leaders and the media pretending that acting-President Mahmoud Abbas (whose term expired way back in 2009) is an elected leader. To further underscore the point, a poll conducted by the Palestinian Center for Policy and Survey Research in August 2014 found that 61% of Palestinians would vote for Hamas. The breakdown was 53% for the terrorist party in Gaza and 66% in the West Bank. 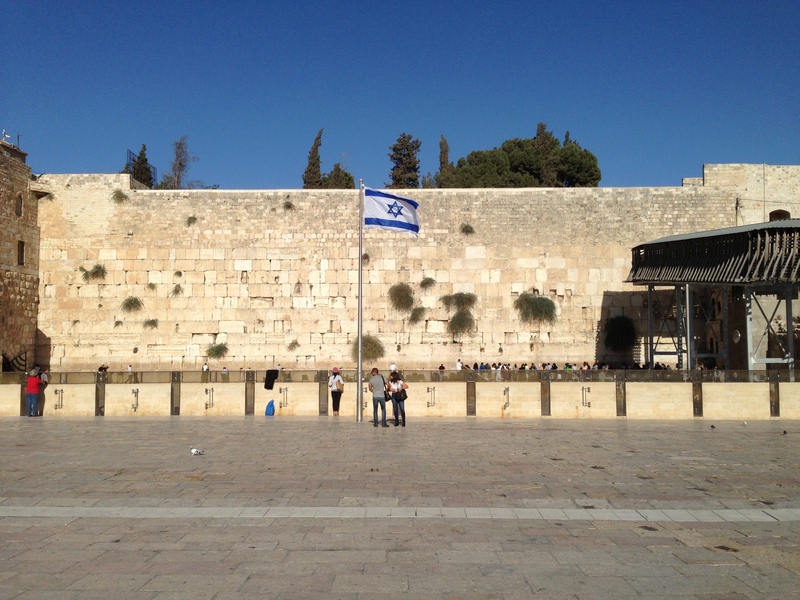 The Palestinian people chose a path of war and continue to support an armed conflict today. They actively elected a group dedicated to jihad and the rejection of any and all negotiations with Israel in 2006, and back that same political terrorist party today. By ignoring the role of the democratic process and the stated desires of the Palestinian people, the past eight years have been mischaracterized as a having three Israeli-Gaza wars, instead of an eight year Palestinian-Israeli war, in which Israel has responded with three defensive operations. For many people, every life form is considered sacred, whether human or animal. In the United States alone there are an estimated 7 million people who restrict their diets to fruits and vegetables. The vast majority of people around the world are not vegetarians. Still, there are limits to what they would consider eating. Domestic animals like dogs and cats are considered taboo in many cultures, and almost all 7 billion people on the planet avoid cannibalism. Even to those that do not consider eating meat to be immoral, there are limits. The concept of the preciousness of life and limits of behavior extends beyond eating habits. Most of Europe has abolished the use of capital punishment. The European Union considers the death penalty to be “cruel and inhuman”, even for heinous crimes. However, 40+ countries still use capital punishment for a variety of offenses. Each society decides the limits of acceptable and extreme behavior. Even among countries that use capital punishment, the nature of the crime makes people assess the level of innocence of the person, the objection to the use of the death penalty, and sympathy for the accused. People may feel more upset when they hear about a homosexual who harmed no one, being stoned to death (in Mauritania, for example), than a mass murderer being executed (in the USA). There is a perceived range of innocence and guilt, and therefore associated gradations of grief. This is true even among civilians who are killed during wartime. Some innocents are viewed as more “pure” than others and their unfortunate demise warrants more despair. Below are three categories of civilians from most to least innocent: Innocents; Targets; and Enablers. 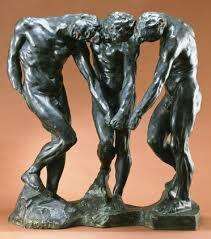 A. Bystanders: In battles, passers-by may be attacked and killed without cause. These people have no part in the conflict and may not even be aware that one was taking place. An example would be the passengers on the Malaysia Airlines flight 17 that was shot over the border of Ukraine and Russia in July 2014. The 298 bystanders were killed without reason- the people had no role in the war. One can imagine that even the people that carried out the attack did it by mistake and regretted the action.B. Children: Children are innocent by definition: they lack knowledge and ability; they have no control of their situation; they neither vote nor fight. Still, almost every war has witnessed children killed. In the War between Gaza and Israel in the summer of 2014, hundreds of children were killed as the fighting took place in heavily populated areas. C. Slaughtered Citizens: Citizens of a country have every reason, right and expectation that their own government protects them. That protection is the primary basis for any government to exist. When a government reverses that course and turns its protective weaponry inwards to target its own population, it is a slaughter of innocents. Consider the millions of German Jews in the 1930s and 1940s who had every right to expect their government to protect them. When the Nazis specifically targeted these citizens, the Jews were left completely helpless. It was not a civil war of a division seeking independence; it was a slaughter of the defenseless by its own army. D. Initial Civilian Targets: Some civilians are attacked because of the actions of their government. The people going to work on September 11, 2001 in the USA were not military targets and were not part of the government. The attackers specifically targeted their places of work – America’s financial and military centers – as they were unhappy with America’s influence and presence in the Muslim world. The nearly 3,000 civilians were just going to work and had no role in, or understanding of the unhappiness of the attackers. E. Civilians Targeted after Military Attack: The victims in Hiroshima and Nagaski were living in Japan when the US dropped an atomic bomb on them during the end of World War II in 1945. The Japanese initiated the war by attacking US military targets in Pearl Harbor four years earlier. As the war dragged on, the US concluded that it would end the war faster by obliterating entire cities which included both people involved in the war and uninvolved civilians who were part of the aggressor force. World reaction to the attack has been mixed, whether the action saved more lives by ending the war faster. F. Civilians Targeted after Civilian Attack: The allies in WWII launched a bombing campaign on the German city of Dresden in February 1945. The Dresden attack was a reaction to the German-initiated war and attack on Great Britain. The further argument given to destroying the entire city was that it was an important center for the German war effort. An estimated 25,000 people were killed in the British and US bombing campaign. G. Backers of War Policy: Civilians are defined as people who are not part of the armed forces. However, there are people who are technically not part of the armed forces but are directly involved in advancing a war. For example, Palestinians voted overwhelmingly for Hamas and its war campaign against Israel in 2006. Hamas has fought constantly against Israel and Israel has responded with three operations: in 2008 (Operation Cast Lead); 2012 (Operation Pillar of Defense); and 2014 (Operation Protective Edge). Many civilians (both those that voted for the war policy and those that didn’t) were killed in those wars. The loss of any life is sad, but it is human nature to react to the particular circumstance of each death. In an extreme example, an 8-year old killed while riding a bicycle brings more sympathy than a convicted murderer getting the death penalty. As detailed in the article above, it is not surprising that even in the finer shades of gray among civilians killed during war, that people feel more horror for the victims of Malaysia Airlines flight 17, than for Palestinians who voted for war. I first came upon the “Save the Children” organization when I saw that they sponsored an appeal to raise money for Gaza in a poster in the London Underground. The name of the group sounded so innocent and well-meaning. Who is more innocent than a child? Who could possibly be against helping children? Can helping children ever be considered a biased agenda? Some days later, I came across a retail thrift store bearing the STC name in Bath, England. Posters in the store window contained two new appeals to help rebuild Gaza and to stop the “Israeli” War in Gaza. There was no appeal or comment to stop the Palestinian war against Israel. I decided to look into the group on their own website. The President & CEO of STC, Carolyn Miles, posted a blog called “Gaza’s Miracle Tomatoes” on July 8, a day after Israel launched Operation Protective Edge to stop the bombardment of Palestinian missiles into Israel. It was her first ever (and currently only) post about Israel or Gaza. In the column she describes the “bleak landscape” and “dusty barren patches” of Gaza. The scene contained “donkeys pulling carts filled with rubble and surrounded by men and boys along harsh, rocky earth”. Gaza had a flourishing greenhouse business built by the Israelis for years. The Israelis cultivated 1,125 acres and built hundreds of greenhouses in Gaza while there in the 1990s up until they left in 2005. The business generated roughly $75 million of revenue. Jewish donors bought and donated the greenhouses to the Palestinians. World Bank president James Wolfensohn, Mort Zuckerman and several others paid the Israelis $14 million for two-thirds of the greenhouse equipment to donate them to the Palestinians (some Israelis opted to not take the payment and take their equipment with them to re-start businesses back in Israel). The Palestinians looted and destroyed the greenhouses. Soon after the expulsion of Jews from Gaza, Palestinian looters stripped the greenhouses of the irrigation pumps, computer monitors and greenhouse sheeting, leaving over one-fourth of the greenhouses bare. The businesses withered. The children of Gaza have better health statistics than almost all Arabs in the Middle East. According to the United Nations, UNICEF and UNRWA, Palestinians in Gaza have the highest immunization rates and longest life expectancy of surrounding Arab and Muslim countries (including: Turkey; Jordan; Egypt and Iran). They have the highest literacy rate.However, the facts don’t add to the Save the Children’s non-miracle. Save The Children claims it does not choose sides, it just chooses children, but is that factual? Is the characterization that the children of Gaza suffer because of the actions of Israel – as opposed to the actions of their parents – really not taking sides? Is a minute and one-half video featured on the STC site that only shows bombings in Gaza (and nothing in Israel), not choosing sides? Has STC helped fund a single bomb shelter just a few miles away, in the targeted playgrounds of Israel? A bigger question for Save the Children – and the world – is how do you protect children from their own parents? Vacation is a time to relax; a time to turn off the work, the sights and sounds. During the terrible period of global violence of August 2014, it was a welcome chance to escape. Traveling to a foreign country could theoretically give a person a chance to focus on just being a tourist and detach from craziness of every day. England has so many great attractions; it seemed a well planned day would keep a diligent tourist occupied. However, the walls, streets and people of England were obsessed with a perceived Israeli “occupation” and aggression that bombarded the short break. 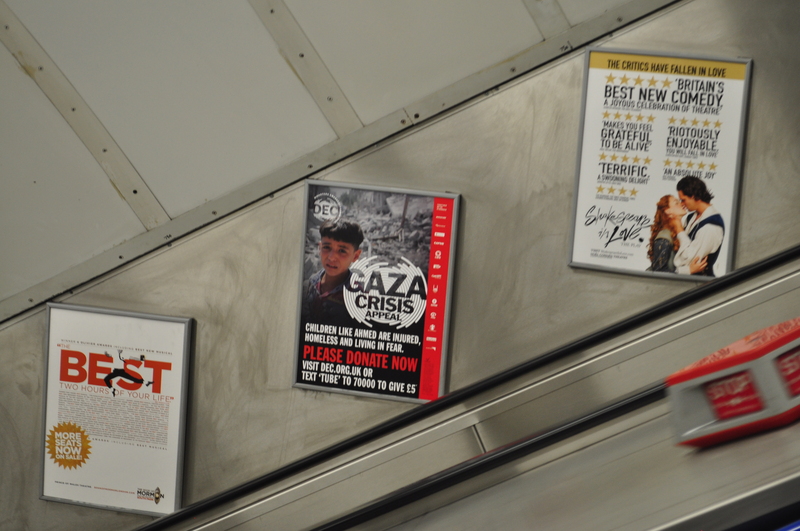 The London subway, the “underground”, was filled with posters entitled “Crisis in Gaza”. The poster had a picture of a boy in front of what appeared to be the remains of a building. The text alongside the picture had an appeal to text in £5 to help him rebuild his destroyed home. It was endorsed by a dozen organizations including Oxfam and Save the Children. Of course, the posters did not describe how Hamas started the fighting and launched its rockets targeting Israeli civilians from Gazan civilian neighborhoods. There were many stores in London with banners that called to “end Israeli apartheid” posted in the store windows. 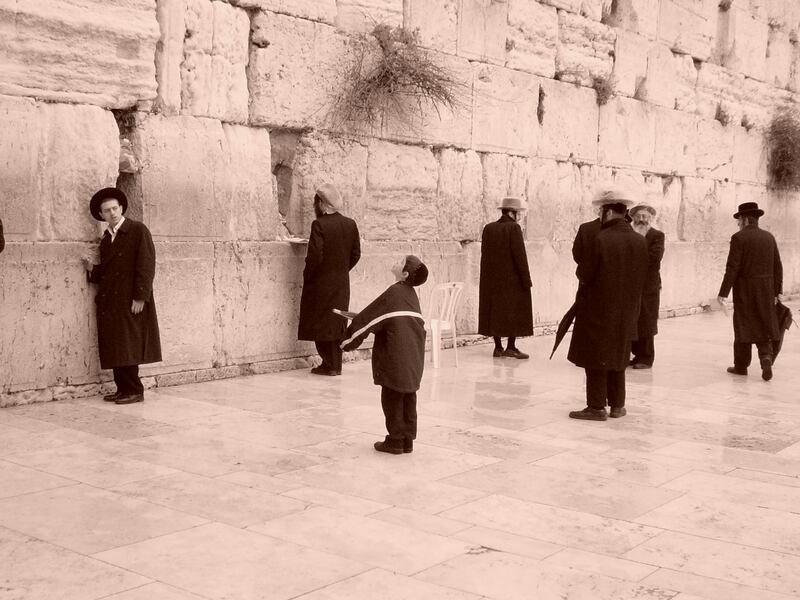 Of course, there were no notes that Israel has over 1 million Muslim citizens, but Gaza doesn’t have a single Jew. The Saturday protest I stumbled upon had about 150 people waving Palestinian flags and yellow flags with a black four finger “R4bia” on it. The R4bia flag originated as a protest to the overthrow of the Muslim Brotherhood in Egypt, but has spread across the Middle East and beyond as a call for jihad against western values and a restoration of the caliphate. Of course, a quiet protest against the overthrow of the democratically-chosen Egyptian government masks the movement’s greater goal of a new Muslim world order. 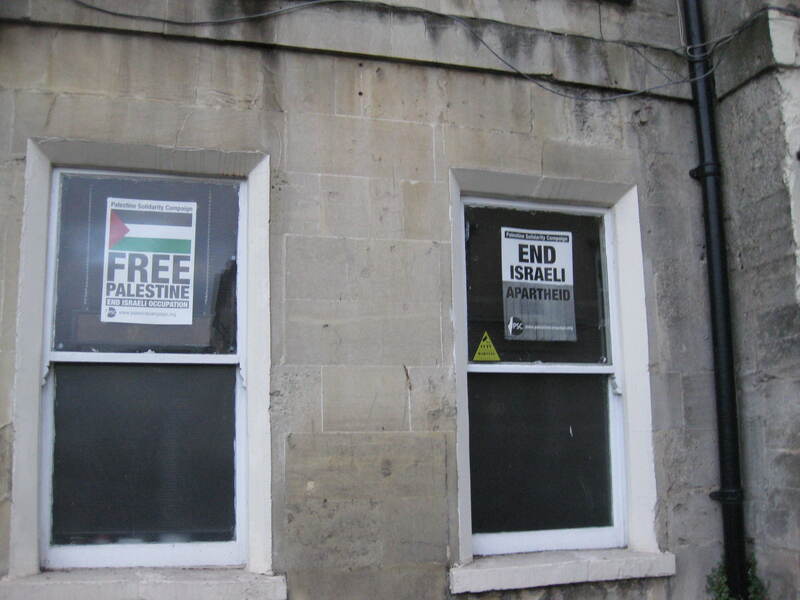 In the town of Bath, England, a building housing the Islamist Society hung banners that read “Free Palestine” and “End the War”. It was unclear but understood that the sign “Free Palestine” was a call for war to destroy Israel which was contrary to the other sign (or more to the point, end the war in which Hamas was losing). In Brighton, a fruit store had two placards at the checkout counter: one read “End the Occupation” and the other read “Free Gaza”. Of course, there was no note that Israel left Gaza in 2005 and didn’t enforce an embargo until 2007 when Hamas (dedicated to destroy Israel) took control of the territory. So much for getting away. I sought a moment to close my eyes to today’s troubles. Instead, ironically, I was constantly confronted by arguments that were blind to reality. Sometimes a contrast in coverage helps boldface the biases. After the elections, on August 11 the Times continued to use positive expressions: “thousands massed…and erupted in applause” to Erdogan’s victory, while caveating later in the article that there were some concerns among the country’s “liberals” about an “authoritarian” streak in Erdogan. But if the New York Times likes you, certain facts will fade to the background. Consider the surprisingly low-turnout for this first-time Turkish presidential election: only 74% came out to vote compared to 87% in 2011 general elections. The NYT said that few people showed up to vote “presumably because many had assumed Erdogan would win”. Erdogan squeaked out a win with 52% of the vote compared to the second place winner at 38% – only 37% higher. However, the NYT said “the election felt like a coronation”. By way of comparison, look at the way the Times covered the election of Israeli Prime Minister Benjamin Netanyahu in January 2013. The Times did not include any of the commentary used for Turkey about Israel: being a strong US ally; the strong economy of Israel; the island of stability in the sea of chaos of the Middle East. Instead, the headline read: “Tepid Vote for Netanyahu in Israel Is Seen as Rebuke”. 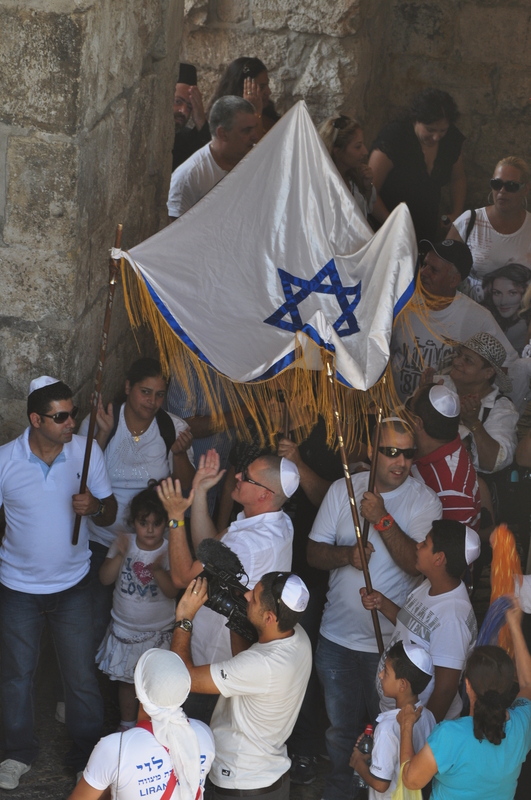 In that “tepid vote”, Israelis came out in numbers greater than ever before – 67% voted for the cabinet, compared to the 2009 election turnout of 65% and of 63% in the 2003 election. Not only was the vote not “tepid”, but Netanyahu’s Likud party won the vast majority with 31 seats compared to the second place winner, Yesh Atid, with 19 votes – a margin of 63% (almost twice Erdogan’s clearance). This last quote is a particularly embarrassing and revealing lie. Jodi Roduren (who wrote the piece from the fantasy of her head instead of based on facts) sought to lay out a scenario where the Israeli public disagreed with the “aggressive push to expand Jewish settlements”. 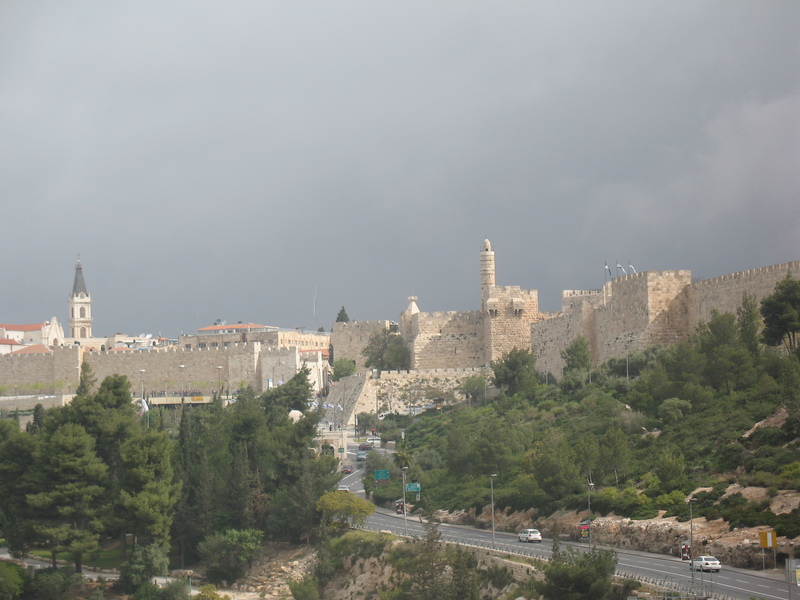 In the real world, both the number two party, Yesh Atid (19 seats) and the number four party, Jewish Home (11 seats), were in favor of a united Jerusalem and continuing to build homes for Jews in Judea & Samaria. The Jewish Home party campaigned on the basis of annexing Judea & Samaria. The Times’ favorite parties, the left-wing parties of Hatnua and Meretz came in almost last place with 6 seats each. (If you’re counting at home, that’s 61 seats versus 12 seats for the parties that want to keep united Jerusalem- a margin so large and bold you would think Roduren’s handlers could have managed to edit her “news” article). The Times ignored reality in both situations. In Turkey, it failed to report on Erdogan’s strong right-ward shift into deep Islamic camp and painted him as more of a moderate. His modest win as blown out of proportion. For Israel, Netanyahu’s strong win was considered poor. The country’s support of his policies about the rights for Jews to live all parts of Judea and Samaria were not just dismissed, but painted in a way that was completely opposite of the facts. I sometimes think of the Times the way I think about turkey: it tastes quite good but it puts a person to sleep. Oh, and of course, it is one of the dumbest animals on the planet.